Old Man Logan #38, by Ed Brisson, Dalibor Tajilic, and Carlos Lopez, continues Logan’s crusade to find out what’s on Kingpin’s USB drive. But will what he finds out be worth all the lives lost? 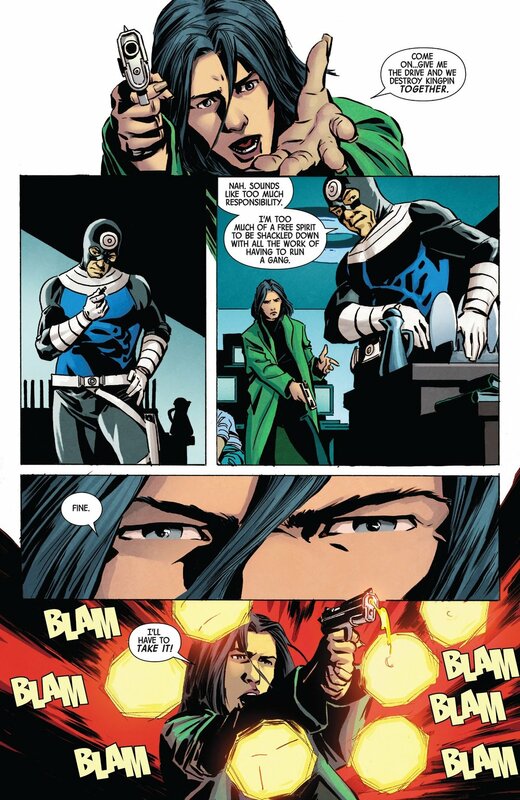 At the hacker’s apartment, Bullseye confronts Sarah, Kingpin’s biographer, and takes the drive from her. Sarah tempts him with the content of the drive, telling him he could be a boss with what’s on there. Logan, barely healed from his fight with Bullseye and leaving the site of their fight, is accosted by New Yorkers who want vigilantes out of their city but is able to escape. Bullseye wounds Sarah and takes the USB drive, stealing a car. Logan, also having taken a car, catches up to him. They fight and Logan takes the drive back. He goes to Kingpin’s office, where Kingpin offers to show him what’s on the drive. Logan is surprised by the contents and Kingpin is able to bribe Logan into walking away. Logan begrudgingly lets it go but promises there will be a reckoning. Brisson makes a mistake in this issue that might seem a little nitpicky to point out, but here goes. Logan flies through the windshield of the car Bullseye is in. It’s a cool scene and all, but Logan is already injured and dealing with a compromised healing factor, and doing this would just add to the wounds. Logan has always been an impulsive fighter, but this doesn’t really make much sense both from a story standpoint and a writer’s standpoint. Brisson has spent a lot of the last few issues underlining how bad Logan’s healing factor was and for this sequence he totally forgets it because it looks cool and makes the fight happen. There are other ways for him to show this so it’s an odd choice. The revelation of what’s on the USB drive is pretty great. It’s not what readers would expect and it shows a side of Kingpin that isn’t always seen. His handling of Logan is also classic Kingpin, which is very cool, but classic Kingpin is just that. Kingpin is in a new class and for him to be using his same old tricks is kind of disappointing. This story could have been so much more, with Kingpin using his new position and resources to make life difficult for Logan. 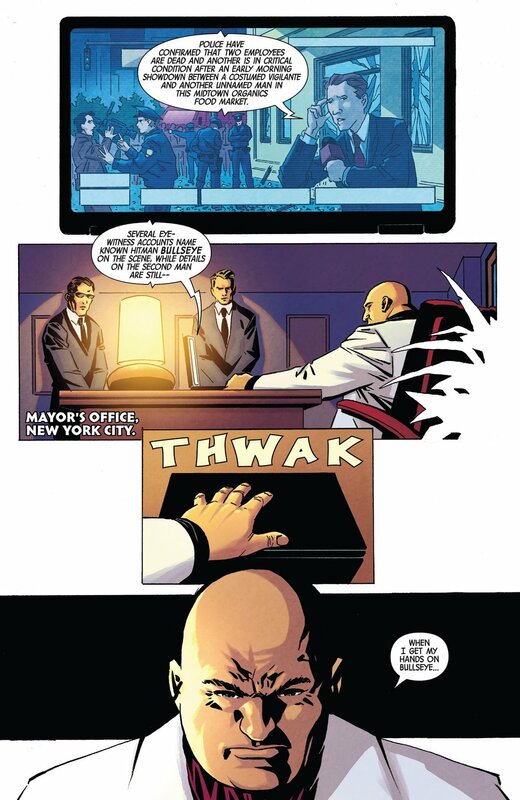 Instead, Kingpin does what he has always done, siccing Bullseye on the problem and blackmailing his way out of it. It’s still an entertaining story--Logan has rarely come up against an enemy he can’t just cut until they’re down--but it had the potential to be something new. The art is all over the place. In some places, Talijic’s perspective and proportions are bad and in other places, the grittiness of his art works rather well. Like the last few issues, it isn’t bad art, it’s just not consistent. There is an art problem in this issue that doesn’t have to do with the penciling, though. In the last story arc, Logan lost a hand and his adamantium claws so his healing factor regrew them, giving him bone claws. Carlos Lopez’s colors never illustrate this change. He always colors both sets of claws as if they are both made of adamantium. It’s sort of glaring that no one caught this little flaw. For continuity minded readers, it’s a little maddening. Old Man Logan #38 is an entertaining yarn that squandered its potential. It presented a traditional Kingpin story when it could have done something more with the character. It tried to impress upon the reader how weak Logan’s healing factor was, but forgot that when to set up an action scene that could have been done a different way. The art was unremarkable for the most part, with some weak perspective and proportions and was rather sketchy in places. It’s the weakest story of Brisson’s run so far. For readers who have been reading since it began, it’s not going to make them drop the book, but it’s not one that should be recommended as a good jumping on point. It works but it doesn’t wow.